First of all, please understand that none of the ride/route suggestions below are "organized" rides of WFO-3. There are no organized rides. If you want to get some friend together and do one or more of these rides, great -- but you're on your own. In fact the only "organized" event at WFO-3 is the dinner on Saturday night. The rides below, by name, are ones we've done in the past and found enjoyable on a motorcycle. We've put each route on its own Web page so you can print the one(s) that interest you and stick them in your map case or tank bag. The mileages are pretty accurate if you follow the recommended route. The times are very conservative, and are probably good guesses for groups with riders of varying skill levels. The secret to making good time, obviously, is to not stop very often, and don't let the stops drag on for too long. We highly recommend that you ride at your own pace, and don't get sucked into trying to keep up with the guys (and women) who ride faster than you. Unless your name is Valentino Rossi, there's always somebody who rides faster than you, so this means you! Besides, the scenery is beautiful, and you might want to ride slowly enough to enjoy it. Make sure you bring good road maps of the area. AAA maps are among the best. Washington, Oregon and Idaho print some nice (free) "Official" highway maps each year, and you can get them from the appropriate Visitor Center by showing your out-of-state drivers license. Idaho lets you order maps online, you might have them send you their free State Highway Map. 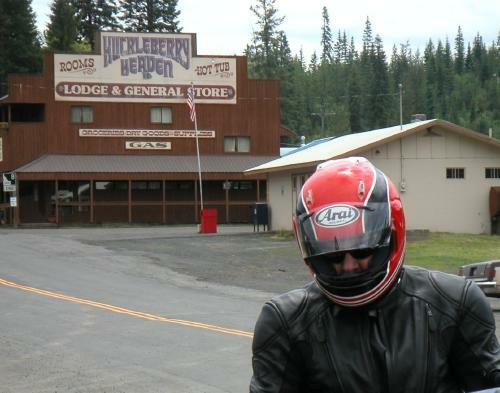 Idaho and Montana don't require motorcyclists to wear helmets. Washington and Oregon do, however. We want you to always wear your helmet when riding to, from and during WFO-3. Idaho also requires proof of insurance, and if you get stopped in Idaho you will be asked to prove you're insured. If not, it's a $400 ticket. Deer! Be alert at all times. Hooved forest rats (aka deer) are a plague in these parts, and they are likely to jump onto the road in front of you even at 12 Noon. Where you see one deer, there are usually more close by that you don't see. Slow down! Too many of my friends have hit, or been hit by these miserable creatures. You're also likely to see other wild four-legged creatures. Watch out as well for large game birds including wild turkeys -- they are far too large to hit without serious consequences. And please read Nick Ienatsch's The Pace if you haven't already. It might save your life. Reading up on how to do group rides is also a Good Idea. This is a fairly short ride (121 miles, 3 hrs) with a great place for wild huckleberry pie at the far end. Plenty of twisties and open high speed sweepers to keep the m/c thrill factor high. A dumb name, I know, but look at the outline of the route and tell me it doesn't remind you of Homer Simpson's wrinkly old dad! On this 170 mile, 4.5 hour ride you'll sample the Spiral Highway, the Snake River, the Almota Grade, and some nice country roads. A pleasant ride in spite of the name. This 196 mile ride follows some well-paved local 2-lane primary roads past the gorgeous Palouse Falls -- a 200' waterfall in a steep canyon in the middle of the desert. On this roughly 5 hour ride you'll also get to sample the Spiral Highway, and cross the Snake River twice. 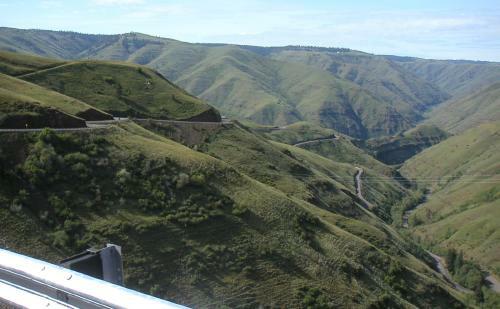 This is a 202 mile version of the ride just listed above, and also goes past the gorgeous Palouse Falls. On this roughly 5 hour ride you'll also get to sample some remote country roads, and the fine twisties just south and north of Central Ferry, along the Snake River. For a dozen or so extra miles, you can avoid Colfax on the return in favor of some more nice curvy country roads. 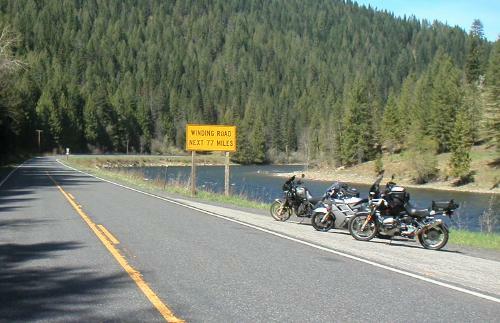 This ride includes two of HMarc's favorite roads, ID-99 and County Road P1 (the Ahsahka Grade) into Orofino, ID. A 231 mile ride (6 hrs) if done in its entirety, but there are several places to bail out and make the ride shorter (as little as 118 miles). Includes the "Spiral Highway". This is basically a north-south ride out, ride back kinda deal. But the Rattlesnake Grade is a super fun road, and the scenery is awesome. If you move right along and don't stop much, you can shorten the estimated 6 hours considerably. The total mileage is 239, but there's an option that gives you 75% of the fun stuff for a cost of only 120 miles and less than 3 hours. This 264 mile, roughly 6.5 hour ride puts you in beautiful downtown Coeur d'Alene for lunch at the half way point. Lots of choices -- though I recommend Takara for sushi, Moon Time cafe (excellent food and Guinness on tap) on Sherman at about 17th or so, or the cafe in the Coeur d'Alene Resort for the view. The ride has a nice mix of tight twisty stuff, open straights and sweepers, and pretty scenery to look at. A 315 mile, 6.5 hour ride to a remote Idaho city in the Nezperce National Forest (don't confuse it with the shorter ride to Elk River). You can do it as an out-and-back on the same road, or make a loop returning on US-95 (longer, but possibly quicker). This route is probably doable as a Saturday (July 31st) day ride provided the group isn't too big, you leave by 8am or so, and you keep moving right along. Total mileage is 345 or so, and timewise it will take about 9.5 hours. Includes 20+ miles of very good, hardpacked gravel. There's an option to omit the gravel, but it requires careful fuel management. Read it and decide for yourself. This is a long one: 470 miles and approximately 11 hours. It runs up Lolo Pass from west to east, and returns via HMarc's secret road. Options are mentioned to shorten the route, either in time or mileage. This is more likely a ride you'll do part of on the way to or from WFO-3. You really don't want to miss dinner on Saturday night! Trust us. Copyright © 2004, by H. Marc Lewis. All rights reserved.